Plans to increase HGV deliveries to Hinkley Point C to 750 lorries per day are being considered by councillors. 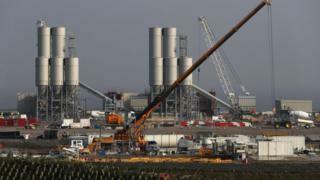 French energy firm EDF wants to raise the limit on daily deliveries to the nuclear reactor by 250 a day until 2019, while a sea jetty is being built. The proposal, which includes a £4m "mitigation" pot, is being considered by local councils later this month. But councillor Brian Smedley said unless Bridgwater Town Council was consulted residents would be "hostile". Currently the maximum daily limit of HGV deliveries to the Somerset nuclear plant is 500 per day. EDF wants to increase that average limit until the end of September 2019 when a jetty will be built, allowing 80 per cent of building materials to be brought in by sea. A decision will be made by Somerset County Council, West Somerset Council, Sedgemoor District Council and Highways England later in December. Mr Smedley, chair of Bridgwater Town Council and Labour district councillor, said there was already a "lot of congestion and grief" and the increase would create "more congestion". "The town council needs to be consulted on this - they didn't consult us at all - they [the people] need to be part of that decision otherwise they'll just be hostile to this," he said. David Eccles, from EDF, said there were around 16,000 vehicles a day on the A39 and an extra 250 lorries would not make a "huge difference". "We're cracking on and we need to keep the momentum going, and in order to do that we need to keep getting material to site and therefore we need to increase the lorry movements, unfortunately," he said. "We do appreciate that it's a massive inconvenience for local people which is why we've agreed this mitigation package."